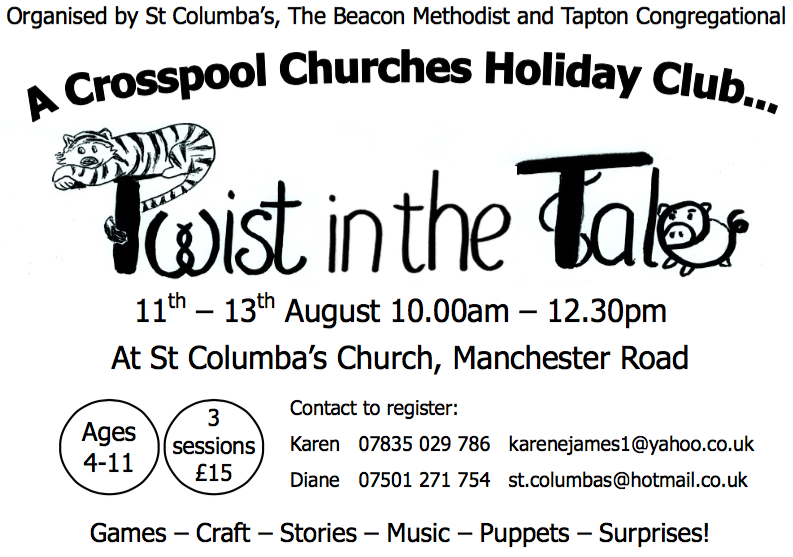 Places are still available for the Crosspool churches Holiday Club which runs 11-13 August. Children of ages 4-11 are welcome. Sessions run at St Columba’s from 10am-12.30pm each day, at a cost of £5 per session. The programme so far includes storytelling, craft, baking, games, music and puppets! Book by contacting Karen at karenejames1@yahoo.co.uk or Diane at st.columbas@hotmail.co.uk. This entry was posted in churches, events and tagged holiday club, twist in the tale. Bookmark the permalink.